There’s Something Amazing; Don’t Miss It!! 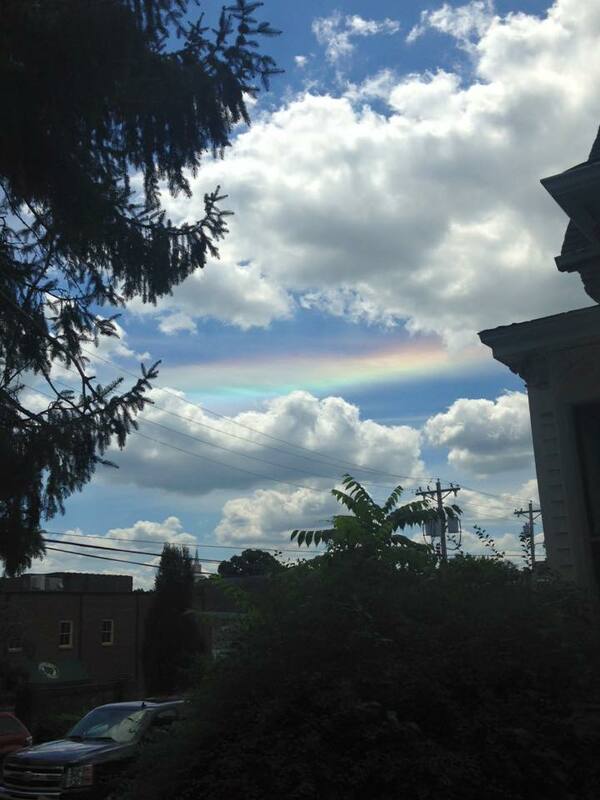 Yesterday, I got to see a “fire rainbow.” If you don’t know what that is, don’t worry, either did I. It’s basically a rainbow that appear like a cloud in the sky, just kinda floating there, being beautiful. I was on my way to lunch when, being the weather geek that I am, I looked up at the sky. And there it was. At first I was incredulous – what was I looking at? But then, out came the camera as I thought, “No one is going to believe me!” All around me, cars were driving, people were walking, and no one was looking up. Here was this totally amazing, beautiful, unbelievable thing happening right in front of them, but they didn’t see it at all! Some guy stopped his truck on a crossroad and saw me staring up at the sky. I glanced over at him and excitedly told him to get out of his car, that he wouldn’t believe what I was seeing. For some reason, he did it. He actually parked his truck, got out and looked up and before I knew it, he had his phone out, taking a picture, and saying, “No one is going to believe this.” And he thanked me for showing him. I repeated this same enthusiastic dragging of people out to see this phenomenon at the restaurant, where the server probably thought I was crazy as I pulled her out the door and into the street to look at the sky. But after she saw it, she thanked me for making her come out and went back in to grab her coworkers. The whole thing lasted about 5 minutes before the rainbow dissipated and the moment passed. For the vast majority of people under that “fire rainbow” nothing special had happened. Most people with their heads down, or eyes straight ahead, or hands hard at work, never saw anything extraordinary or even knew they missed something amazing. But for me, who looked up and saw it, and for those I shared my excitement with, the day was just a little bit brighter, the moment just a little bit more miraculous, and the atmosphere just a little bit more full of joy. So many times serving in Children’s Ministry, I feel like this is my job. I have seen kids do, say, and act in amazing ways. I’ve watched them pray for one another with more faith that I could ever muster up. I’ve seen them worship with an abandon I could only hope to experience. I’ve heard them say things with such conviction that it cuts me to my heart and with such innocence that it spurs me on to walk in grace and truth. I’ve seen amazing things, miraculous things, phenomenal things come from children. But, that’s not the norm. Normally kids are just kids, which is not bad (I mean really, the sky is always beautiful even if there’s not a floating rainbow cloud in it), but it’s also not breathtaking. Well, not breathtaking in a good way – there are definitely things kids do that will take your breath away. And because kids are often just average, like us, we tend to “not see” them. I’ve found this can be especially true in church where sometimes kids are not even in the same space as adults so that they can be seen. Everyone is just going about doing their thing and the moments get missed. Sometimes, it just takes one person who “sees it” to tell others to look. Sometimes, it just takes a glimpse “up” to see something miraculous. Sometimes, it just takes a few steps out of the comfort zone to find something amazing just outside. I know sometimes I “look crazy” to my fellow Christians when I get excited about kids in worship and discipleship at home. I’m that lady on the sidewalk telling you to get out of your car to see something in the sky. I’m that woman who comes to your counter and tells you to leave the register and come outside to see something cool. But, I can’t help it. Because I’m genuinely and honestly excited. Because I’ve seen something miraculous. I’ve seen something amazing. I’ve seen something unbelievable and a picture however beautiful can’t capture it, a video however compelling can’t show it, and a testimony however compelling can’t let you experience it. But if you “look” you’ll see it. You’ll see it in the most unexpected moments and the strangest places. You’ll hear it in little voices singing praises and growing voices shouting His name. You’ll hear it when they say “Amen” just a little louder than everyone else at church and when they dance just a little more than, well, anyone else in service. And it will touch your very soul. I promise. Because, as Jesus tells us, the kingdom of God belongs to such as these.